Moses really had a handle on the forming, storming, and norming speech and the biggest impact was Mr. Cook and myself leaving the room so they could hash things out. They have added items to their team agreement and even came up with their own incentive reward plan when the team meets certain goals. 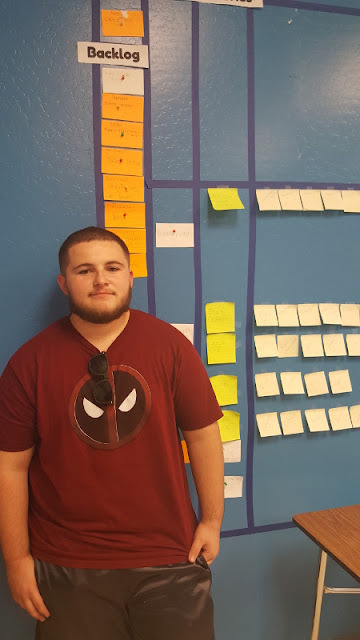 They also realized a key lever in their team stress was that their scrum board was not in a location that was functional with their meeting space. So, without asking us...they moved it...AS A TEAM!! They were so proud of their progress today and everyone left on cloud 9. I couldn't have asked for a better turn out. P.S. they are shifting to 1 week sprints. A student Scrum team had been organizing a very large community event. They were using two week Sprints to deliver their work and had selected a large number of activities to do in each Sprint to meet a perceived goal of 16 events (self-created). There were some conflicts arising as students who recently started this school year worked to organize themselves to share work. The Principal called me for some guidance. We discussed ways to empower the students to solve this rather than teacher or principal involvement (something important to the Blueprint Education folks and their culture). We would share the Tuckmann team formation model of Forming, Storming, Norming, Performing to let the students know that what the were going through is normal and there is nothing wrong with them. Krissyn Sumare (the Principal) sat in the room for support while Moses (a Scrum Master on the student team) learned about the concepts, why it was important, while intently taking notes and asking questions. He was sure this would help the team feel better about things and was anxious to give it a try with his team-mates. Moses went so far as to consider how to get involvement from other Scrum Masters in the resolution. I met Moses last year at this event. He was a shy, reserved person, who looked down at the ground and often avoided eye contact. The Moses I was now talking to intently took notes, asked direct questions, stood tall and was proud and determined to help his team. Moses has become a person who's primary passion is helping the people on his team and ensuring they are all heard. In their environment, this can be challenging. He seems to have taken on the persona of team "healer". I heard about Moses taking students out to other rooms to talk with them until they feel better. I heard about how he gathered everyone to make sure they would all be there as he was worried that everyone might not be there the next day to listen to what he had learned. Before our conversation, people were pretty down. All I can say to Moses (who I hope reads this).. WOW! I am so happy for you. Your outgoing, caring nature and ability to facilitate for people to solve problems will be a great benefit to all those you come across. I am glad you found something to really excel at and am more glad to have met you. I hope you can agree that this team is well on their way to being a very successful student Scrum team with much to offer the world and a great future! They are all such awesome, brave people. I know they would be happy to start a conversation with you. Changing your approach.. Let them know.